The ATA case is a hard sided case that will hold up to whatever abuse the road brings. Recommended as the best protection for airline travel with your backdrop. Solid construction made from ABS laminated wood, metal trim and corners, full-length piano hinge, and recessed locks and handle. The inside is padded with a dense foam. 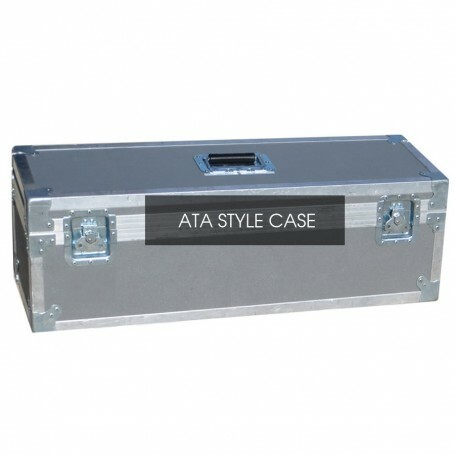 This professional road case is designed to fit one complete portable backdrop set from Shows To Go Backdrops (holds: frame, curtain, and blackout liner). The curtain and liner wrap around the frame when packed into the case. This keeps the packing size down as small as possible. Option choices may affect final pricing. The foam we use is dense and will not tear or get worn down by the velcro ends of the backdrop frame. The lid holds open with a support bar to allow for easy packing of the backdrop. 5x8 Backdrop Note: The 5x8 size buckle and strap case is designed to hold TWO complete 5x8 backdrop sets. Please allow approx. 3 weeks for your backdrop case to be shipped. Due to weight and size, this item cannot be shipped internationally!